Which functions of the seat post are important for you? Even if they might seem meaningless at first glance, the exchange of the seat post can be the trigger for knee pain or can eliminate that pain. If the seat post is adjustable, it means that it already includes quite a lot of technology. Bicycle seat posts deviate in some respects. E.g. for mountain bike riders, there are height adjustable seat posts, while a flexing seat post is probably rather used with road bicycles. First of all, it serves the purpose to optimally adjust your saddle by being adjustable in height and inclination. If you are looking for a new seat post for your bike, there is some criteria to be considered prior to the purchase: The correct diameter, the clamping head and, especially if it is about the material, make the decision dependent on the intended use. A light seat post might be interesting for road cyclists, who place importance on a light weight, while a suspension seat post is intended for the all-mountain-use. Which benefits does the height adjustable seat post or a suspended seat post offer? Whoever likes to leave the fireroad and rather go along heavy terrain, will soon recognize the plus points of a seat post which is adjustable in height. A mountain biker every so often likes to "get up from the saddle", which means that he will stand on the pedals and shift his weight rearwards standing up. This way, you will have more control over the bike when going downhill and it will also be safer to ride on bumpy descents. Do you know the uncomfortable situation when your pants or shorts get caught in the saddle? This definitely is a drawback. In order to avoid that, many bikers stop before a rapid descent and push the seat post downwards into the seat tube in order to achieve more leg space. Legroom is optimal, but another drawback is, of course, that you have to interrupt your ride and that you have to manually press the seat post down. The bike nation has been waiting for the solution to that problem, and since its introduction, height adjustable seat posts are extremely popular in the MTB sector. Meanwhile they have been optimized in regard to weight and function. At the push of a button, the vario seat post lowers and also rises again. It is available with handlebar remote control but there are also versions with a lever beneath the saddle. Kind Shock and Rock Shox are well known names among the manufacturers who have conquered the market. Whoever is completely satisfied without suspension will just take a simple seat post without any bric-a-brac. Such a seat post is at least available in different materials, finishes and thicknesses. Seat posts of carbon are popular in order to save weight. 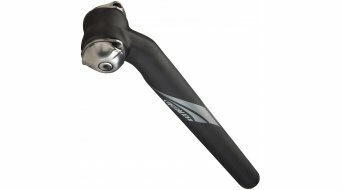 Although the question whether to go with carbon or aluminium for the seat post does not have to make much of a difference any more. There are some aluminium models which can stand their own compared with carbon seat posts as regards the weight. This might give you a better feeling of safety and stability if you do not count yourself among the weightweenie road bike riders. In this case again, more than ever, you have to choose the material which is correct for the intended use. Therefore always take the diameter, the length of the seat post, whether or not the seat post has a setback or comes without offset, as well as the information on the clamping head for taking of certain saddles into consideration.